Pierrot Le Fou is perhaps Godard’s most loved film after Breathless and it isn’t a coincidence that the films are often placed on the same platform for discussion. Pierrot Le Fou intentionally reverses the narrative that Breathless offered which just reinforces Godard’s stand on the nature of the medium. Breathless ended with a murder while Pierrot Le Fou essentially starts with one. The previous film had wandering souls falling in love whereas the latter has two lovers on the run. And even the starting quote of Breathless resembles the final one of Pierrot. He bends the rules all right, but what is more interesting is that he redefines film grammar that he had constructed. Godard continues to play with the genre system, paying homage at times and ridiculing it at others. Early on in the film we see Samuel Fuller putting forth his definition of cinema as being one about emotions alone. And Pierrot tries to do exactly that. As with most Godardian characters, Pierrot knows that he is in a film and also that we know that he is in a film. He tries to make his journey as “cinematic” as possible by trying to indulge in all possible emotions that he can cook up. Surely, Pierrot stands for Godard himself as he moulds his life as per his whims as Godard does with the film itself. 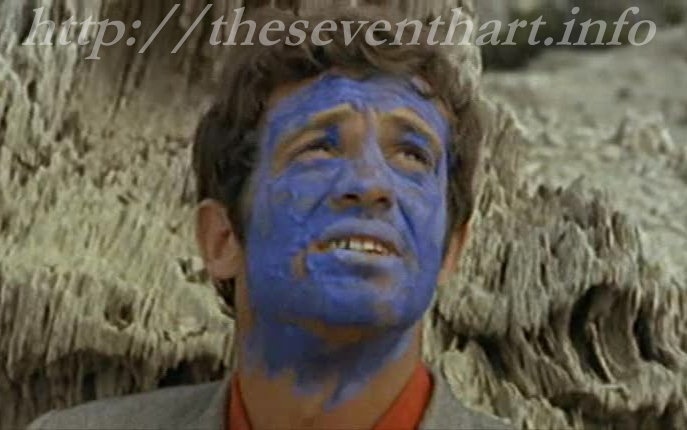 But the film works the most on a personal level as Pierrot Le Fou sharply marks the end to what I would like to call Godard’s Anna Karina years. The film was made after the couple got divorced and Godard seems to lament the years gone by. Pierrot’s suicide in the final scene may be a manifestation of Godard’s own mental landscape. He even insinuates his future moves in the form of the impromptu play that Pierrot and Marianne put up, where he comments on the attitude of the west towards the Vietnam War (and this was when the war was going on, mind you). So, in a sense the film forms the junction between the two starkly different periods of Godard’s filmography. On the whole, a film about a man dissatisfied by conventions and with nothing to lose made by a man dissatisfied by conventions and with nothing to lose.